Strictly Come Dancing on Stars with Ice Factors in the Jungle makeup I can handle. Especially when I got the opportunity to play and wasn’t completely horrified by the actual quality. Plus they’d made the most of all the sequins, glitterballs, cutely packaged bits and bobs… it has that tack-tastic quality that you want from a Strictly Come Dancing makeup line. I’ll be honest… I’ve never watched Glee, but surely if you were going to capitalise on the whole Glee phenomena with a little sideline in makeup… you could put a bit more effort into it? Picture the scene (and bear in mind I have no actual idea how this works.) So… we’re in the Superdrug/Glee/Wholesale Cosmetics people’s boardroom. Eating doughnuts… probably. At least MAC’s stickers were printed in more than one colour. Cheapskates. How in the hell is this Glee-inspired makeup? Once your Gleeky consumer has torn away the cardboard packaging… don’t you think they may be just a teeny bit disappointed with what’s left in the way of Glee-spiration? (ok, I’m stopping with the quips now). 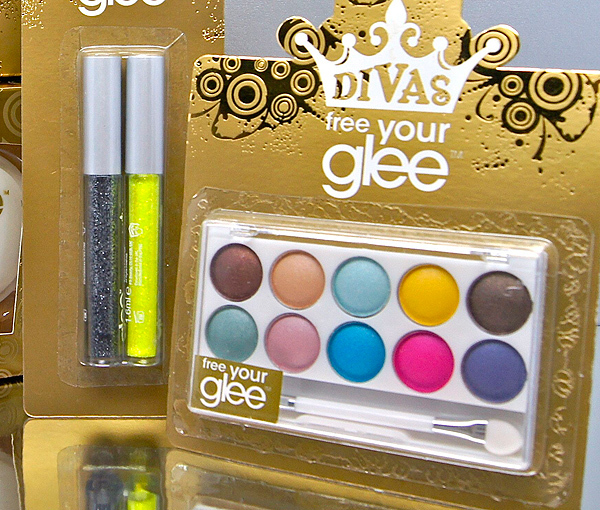 You can go buy your *cough* Glee-inspired makeup which includes *cough* BeautyUK-esque eyeshadow palettes instore at Superdrug now. With prices starting at £3, I’m not saying they won’t make excellent stocking fillers… but if I find one in mine? Mr. L won’t have much to be “Gleeful” about. OH MY WOW…I WAAAAAANNNNT!!!!!! Whee happiness in a photo! Ahh I think this is more for kids really isn’t it? I could imagine my little 6 year old cousin playing with it. Yes, it looks like makeup for kids… like those Hannah Montana or Barbie makeup kits. I’m going to wait until someone swatches them and comments on the quality. I agree that it’s probably for kids… but shouldn’t that mean they need to work HARDER on making it appealing in a GLEE kinda way? Haha, those look ridiculous. I mean, yeah, probably great to get some cash, but nothing that I’d be interested in getting, though let’s face it, it’s quite hard for me to get anything that’s sold in Superdrug! This makes me laugh. I love Glee but agree hardly any thought has gone into this. It would have been good to focus on individuals makeup style in the show and create a set for each character like Quinn which for instance could have a good neutral eye palette, some outer corner lash extensions, and a natural glossy lip product. I agree, the packaging is poor. I’d be interested to know what the quality’s like, but I don’t have high hopes. I do like the look of the plummy- brown eyeshadow on the far left of the top row though! Seriously?!? It looks like one of those powder paint pallettes you get for free with the colouring books for kids. I agree, this is just all about the (poor) packaging. I watch Glee but I wouldn’t associate it with great make-up, or make-up at all really. The packaging has nothing to do with Glee except the word ‘Glee’! Primark make-up is so much better, in fact, Primark’s make-up packaging is actually great! This lot looks like a pile of poop. This is pretty funny. Because the brand Urban Decay has been spotted more than once being used by various characters on the show. If anyone wants Glee inspired makeup, than they should buy Urban Decay. 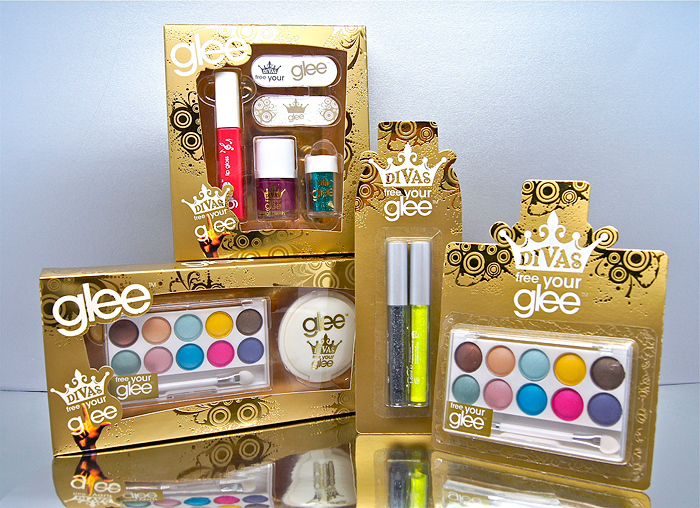 my dad loves Glee, in-fact he loves it so much – he would probably buy these for himself. All I can think is that “Gleek” is the word for when a thin squirt of saliva totally randomly shoots out of your mouth, like when you’re yawning. Except they keep implying that it’s intentional, and I’ve never known anyone who can do it on purpose, but it happens to almost everyone once in a while totally at random. Omg, people.. who cares! It’s called merchandise.. if you dont like glee then see that red button that has an x through it, USE IT. seriously go get a life and stop downing on it..